One of the most important accessories for a lady in the 1920s was her hat. Luckily for us, Aimee, has an Etsy shop where she makes and sells AMAZING recreations of hats from the 1920s through the 1950s. The hats she makes are so beautiful and I highly recommend visiting her shop to see all of her stunning pieces. Thanks so much for sharing with us, Aimee! With the 1920s came a new breed of independent women. The Flapper. She wore her skirts short and her hair bobbed. She painted her lips, drove a car, danced, and listened to jazz. Her millinery needed to express that spirit and live up to her spontaneous lifestyle. The cloche hat is said to have been invented by milliner Caroline Reboux in 1908, became especially popular during the 1920s, and continued to be commonly seen until the early 1930's. Its name is derived from cloche, the French word for "bell". Whoever is responsible for its development, the couture houses of Paris like Lanvin and Molyneux made it a staple, opening ateliers to produce cloche hats designed to matched their clothing designs. 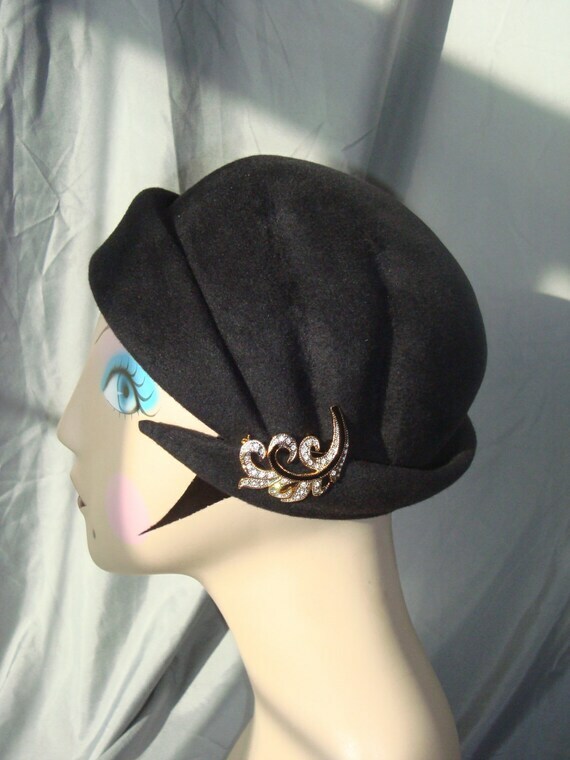 The cloche even inspired hairstyles such as the Eton crop the short, slick cut made famous by Josephine Baker as it was ideal to showcase the hats' shape. Cloche hats were generally made of wool or fur felt and shaped over hat blocks to conform closely to the head. They were worn low on the forehead, displaying the wearer's eyes seductively just below the brim. Cloche hats of straw were also shaped on blocks in a similar manner. For the home sewer, flat patterns were introduced to allow cloches to be constructed at home and outside the atelier out of silk or velvet to match their dresses like the couture houses of Paris. Cloches could also be made of beads or lace for evening wear. 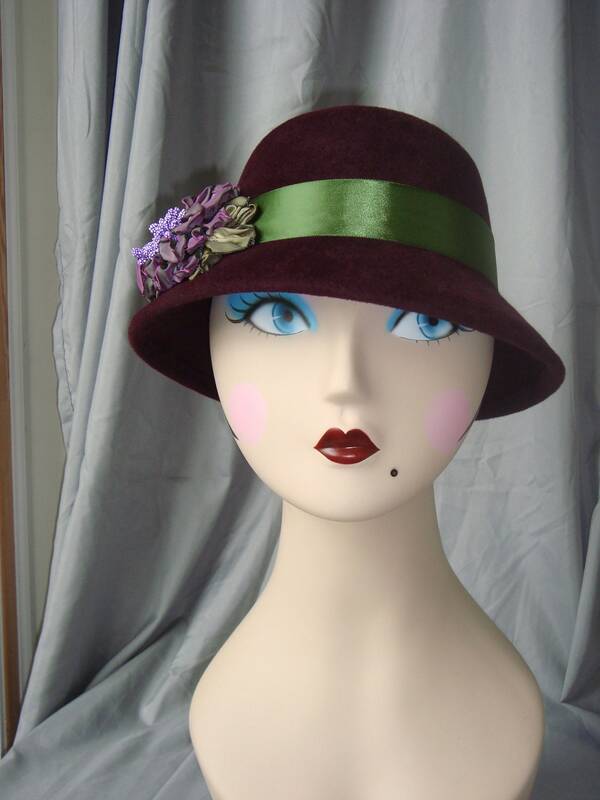 The cloche was often worn plain or simply trimmed. 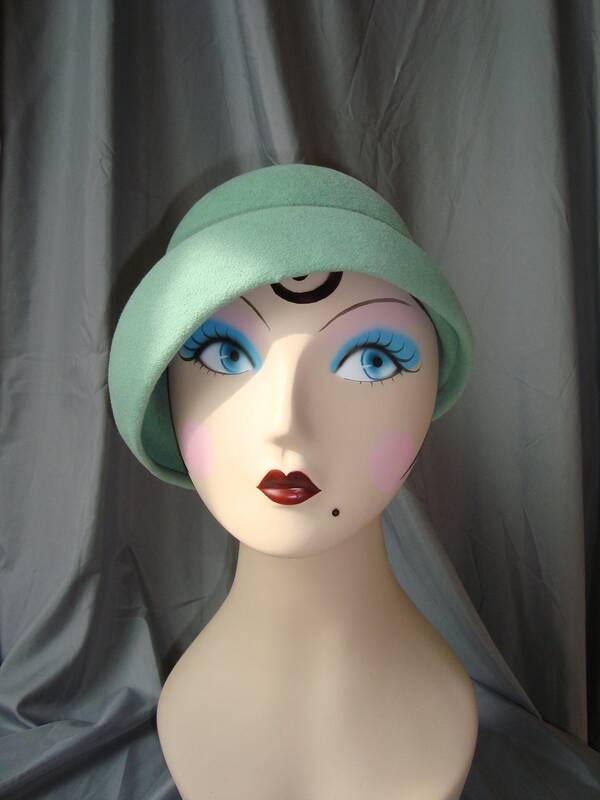 More flamboyantly, the Art Deco style seen in architecture and décor translated into millinery in the 1920s. A cloche could be decorated with deco themed appliques, pleated and structured ribbon, jeweled pins or structure fans of feathers. The cloche could also be femininely interpreted with soft silk ribbon work or millinery flowers. Ribbon style could be used as a manner of conveying not only style, but marital status. An arrow pleated ribbon indicated a girl was single but had already given her heart, a knot conveyed marriage whereas a flamboyant bow displayed single and interested! The same sense of drama and independence played out in evening headdress as well. Inspiration came from Egypt with the archeological discoveries of King Tut's tomb in 1922. Inspiration was also drawn from the exotic orient as well as Russia. 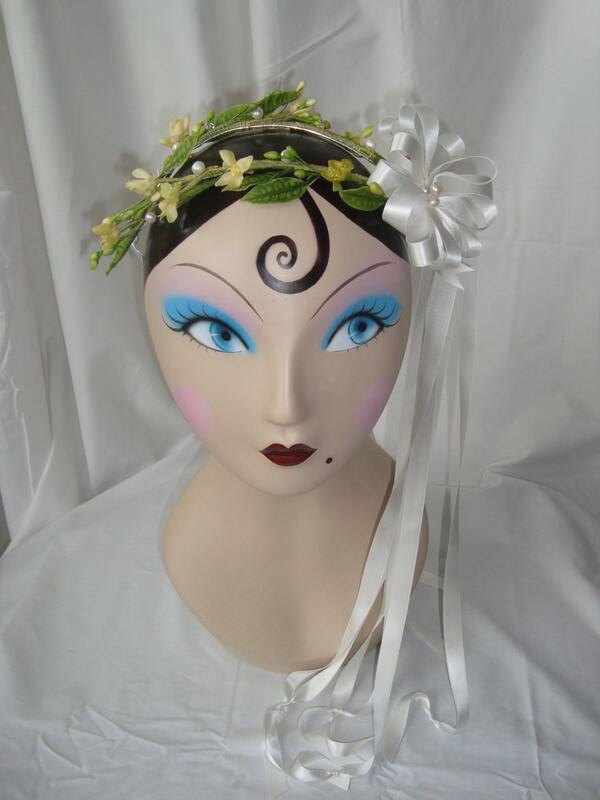 Headdresses including turbans, toques and tiaras were all reinterpreted for the 1920s woman. For bridal wear, cloches of metal work were seen, but the traditional orange blossom continued as a wedding staple. Orange Blossoms figured from wax were generally used as real orange blossoms were in short supply or faded quickly. The wax replica allowed for decadent headdresses to be created for the bride that could survive to become cherished heirlooms. 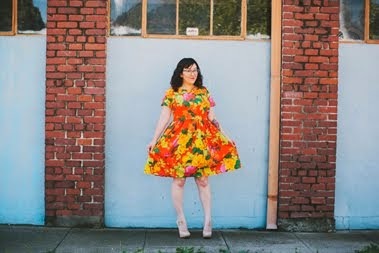 I invite you to stop by my shop. There you will find hats created from vintage hat blocks in the same manner as the 1920 couture ateliers. Custom requests can be made and the options for trim and color can combine into a truly one-of-a-kind piece. My shop also has evening inspired pieces as well as reproduced bridal orange blossom crowns finished with yards of lush silk satin. Do stop by! These are just wonderful. Thank you for sharing this site. Loved reading about the history, especially the connection to archeological discoveries. Thank! Fun! 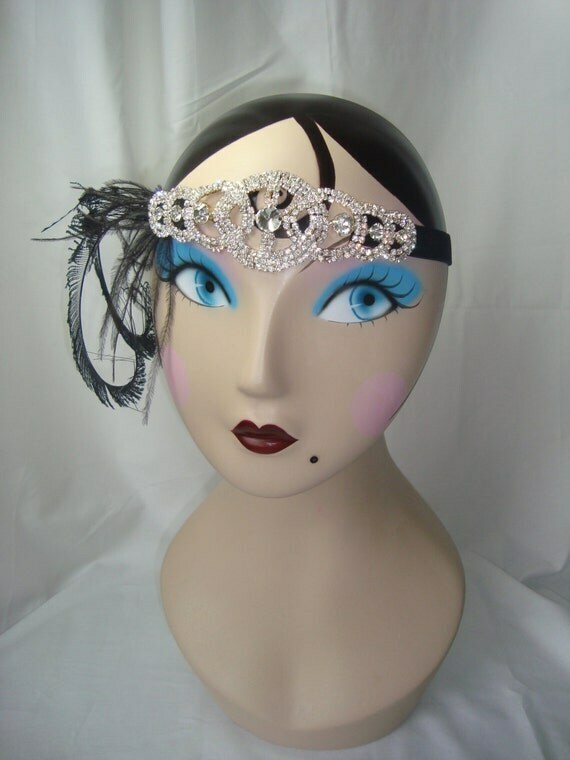 I actually love these hats and am going to try to make one to go with my Great Gatsby Sewing Challege outfit. We'll see if it works!